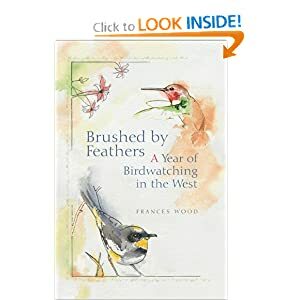 Review: Brushed by feathers: a year of birdwatching in the west by Frances Wood (2004, Fulcrum Publishing, Colorado). What a delightful book. I was given a copy by someone (a friend of a friend) who attended one of my bird talks. I am normally reluctant to let people lend me books to read, no matter how interesting the subject matter because I have so many books and magazines of my own waiting for my attention. Still, out of politeness I accepted this title, and I’m so pleased that I did. At first I only read a few pages in bed before turning off the light. As I moved further into the text I became hooked – no, spellbound. This is one special book, and all about birds I know nothing about. The author lives on Puget Sound in Washington State near the Pacific Ocean. It is a significant body of water for many water-bird species and the hinterland a passageway for many other migrating species. The book is an account of a year, month by month, in the birding life of one small area: the author’s small acreage around her home – with occasional trips elsewhere or reminiscing accounts of earlier trips and experiences. From the Barn Swallows nesting under the eaves to various hummingbirds visiting her feeder through to rare encounters, the author takes the reader on a journey of wide-eyed, wondering and fascinated observations of the daily lives of her feathered friends. Her descriptions of the house and garden, the local environment, weather and daily happenings take the reader into her confidence until we feel almost part of her family. Her lyrical style draws the reader on from bird to beautiful bird, each described with care – as if each was her personal favourite. The author’s web page can be seen here. Last night I was the guest speaker at the Lower Murray Bird Club here in Murray Bridge, South Australia. I had previously showed bird photos and spoke about Australian birds to this group about 3 years ago. Thinking that the membership is probably fairly static over a relatively short period of time, I made up a completely new talk with more recent photos to show. Just as well, because quite a few remembered my talk from back then. I’m not into keeping birds in cages or aviaries, preferring to see my birds in the natural state. All the same, it was good to speak to a group of people who are all bird lovers, no matter where one sees them. Out of the many thousands of bird photos I could draw on for my talk, I tended to focus on those I had taken in walk-through aviaries, especially those at Adelaide Zoo. I was made to feel most welcome and the audience was very attentive to what I had to say. I think they also enjoyed the photos I had chosen. I only wish I had a small portion of their bird knowledge, especially in the care of birds. I could be so much more helpful to my many readers if I had a broader knowledge in this field. I am trying; recently I’ve added a few more books to my growing library which will help. People living in South Australia have many bird clubs that they could join. While many of them do not have their own websites, there is a combined site listing names, localities and contact details. The site is the United Bird Societies of South Australia (Click to access). If you are a member of a group which might like to have me as a guest speaker, don’t hesitate to contact me through my contact form at the top of this page, or click here. House Sparrows are a very common introduced bird species here in South Australia. They seem to breed in good numbers in our garden. They can also be very opportunistic where it comes to feeding, and they can be very cheeky when doing so. I saw a classic example in the CBD of Adelaide on Wednesday. I’d just been to the Royal Adelaide Hospital for a specialist appointment (everything was okay). I then visited one of my favourite bookshops in Rundle Mall. After a short wander through the shop – I resisted spending any money – it was time for some lunch. I wandered into a nearby food mall where there were about a dozen choices of fast food. I resisted the less healthy options and bought an “Aussie Spud” – a potato with a variety of trimmings like cheese, beetroot, corn and pineapple. It was delicious and quite filling. On entering the mall I noticed it was inhabited by a significant number of House Sparrows. The entrance is open throughout the day at both ends so it was easy for the birds to take up residence. Half way through my meal I accidentally dropped a small portion of potato on the floor. I needn’t have worried. Within a second or two, about four sparrows swooped down from their perch on top of a television screen on the wall and the mess I’d made was devoured instantly. Sadly I didn’t have my camera with me at the time. Everyone interested in birds needs at least one field guide to help with the identification of the birds being seen. I have several. Ten, in fact. Six of them are Australian field guides, plus I have one covering the birds of South East Asia, one of the Indian sub-continent and two for the British Isles and Europe. Now I have another one! This field guide is being published TODAY. Many years ago I was given the first edition of this very popular field guide. It has remained largely on my bookshelf in my office, referred to from time to time but never taken out into the field. This was because of its bulky size and being in hardback couldn’t really be called a “field guide” as it was too big to carry around. Recent editions have been far more portable, and this new edition is excellent: convenient size, portable, and at 826 grams just the right weight. There are many fine features in this edition. There are so many I can only highlight those I think are worth mentioning. There are 132 full page colour plates throughout which illustrate every bird found in Australia. The publisher’s use of the word “comprehensive” on the cover is no idle boast. Each colour plate shows about five or six different species, most shown in typical poses to help identification. Birds most often seen in flight, such as eagles and sea birds like terns, are also shown in flight. The colour rendition of each species appears very good in most cases, especially those I am very familiar with. One page I’d take exception to is the plate showing White-eyes and Silvereyes, as the birds I’ve seen in this group have far more vibrant colours. The ‘red’ robins suffer the same fate, along with some of the fairy-wrens. On the other hand, the rendition of the cuckoos, parrots doves and pigeons are very colourful and well done. The birds of prey (owls, hawks, eagles and kites) are brilliant. Opposite each colour plate where the birds are illustrated is the text page. Each species has a short description of the bird, including sexual and race variations. The text also includes details of size, juvenile plumage, voice and preferred habitats. Breeding information is included in a separate section. The text is the part of this guide of which I am most critical. For my needs it is too short, too concise. In many cases I will need to go elsewhere in my library to find the information I need. For the casual bird watcher it is quite adequate. I concede that to expand this section to please me would probably add 20-30% more pages to the volume making it less portable in the field. The authors must have had some tough decisions to make along the way. Next to the text they have included some 900 black and white sketches showing identification features hard to include in the text. This is an excellent feature. The text section is complete with a small map showing normal breeding and non-breeding distribution. Another excellent feature of the maps is to delineate the range of each race of the species, along with extra notes on some species where deemed necessary. A separate section details comprehensive breeding information. This includes a brief description of the nest, number and colour of eggs, incubation periods and what the hatchlings look like. It includes fledging periods and some notes about the care of the young until independence. Each species also has a bar graph showing typical breeding seasons. Special note must be made about the 21 pages of vagrant species included at the end of the colour plates. These pages show sightings of species not normally present in Australia (ie vagrants) but which have been officially accepted on to the Australian list of birds. Some have only been seen the once, others on only a handful of occasions. A water resistant cover – useful on wet days in the field. Help for beginners on how to observe a bird. Where birds live – a useful, informative section on variations in habitats. An extensive glossary of words used by birders. A list of bird-watching organisations. Core library – an extensive list of publications the authors suggest for keen birders to build up their own reference library. We are so blessed here in Australia with so many excellent birding field guides. Each has strengths and weaknesses, so the choice of which to buy becomes an agonising one. 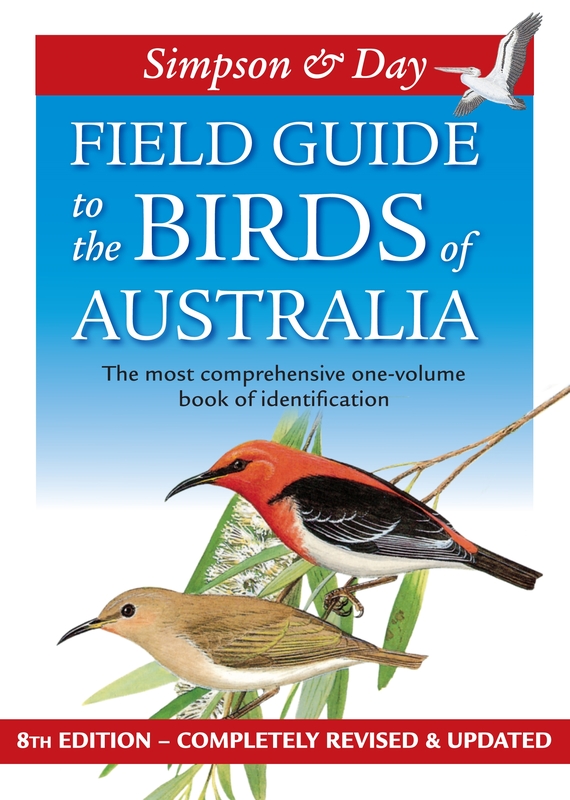 I have no hesitation in recommending this new edition because of the comprehensive coverage of Australian birds in a compact, easy to use volume. An truly incredible amount of information has been packed into its 381 pages. The publisher claims to have sold over 500,000 copies in earlier editions. This new, completely revised 8th edition will continue that trend and sell many more copies in the future. While I would like more information in the text this is just a personal need; not everyone needs the detail I require. For the vast majority of people with a passing interest in our birds, this is an ideal guide to have on the bookshelf or in the car or rucksack when travelling. At a RRP of $39.95 it is also very affordable. Disclosure: The publicist of Penguin Books Australia kindly sent me a review copy a few weeks ago. Thanks Leisel. Simpson, Ken, and Day, Nicholas, 2010, Field guide to the birds of Australia 8th edition. Viking (Penguin Books), Camberwell, Victoria. Penguin Books Australia – click here to visit their web site. Click here to read an extract.